She is talking about Camp Florentine, Tasmania’s longest running forest blockade. The camp is run by the group I’m part of: Still Wild Still Threatened. And it is a place that is very close to my heart, having spent many years spending so much of my time out there in the past. Camp Floz, as it is known, is in the Upper Florentine Valley, the next valley to the west of where I am located in the Observer Tree (in the Tyenna). The Upper Florentine Valley is a large tract of ancient wilderness, that is surrounding on three sides by the World Heritage Area. Despite the protection for the surrounding mountain ranges, this valley remained unprotected because it contains such significant tracts of tall trees that the logging industry were hungry to get their hands on. Almost six years ago now members of the local community became aware of Forestry’s plans to fell 15 logging coupes in the valley within three years and in response the camp was established to stop this from happening. Over those years, the constant presence of the camp has meant that the majority of those logging coupes have never been touched by a chainsaw and the forest remains standing. Hopefully it will continue to remain standing until it can take it’s rightful place as part of the Tasmanian Wilderness World Heritage Area. As well as literally stopping the logging, the camp has a range of other important functions in the campaign. Being on a main tourist road, it acts an information center with people stopping in every day to find out about what is going on in the forest and having the opportunity to go on short guided walks. It has become a significant icon of the forest movement in Tasmania and is known to people all around the world who have stopped in on their travels. When I saw the photos I realised it was even worse than I thought. The entire camp had been torched. 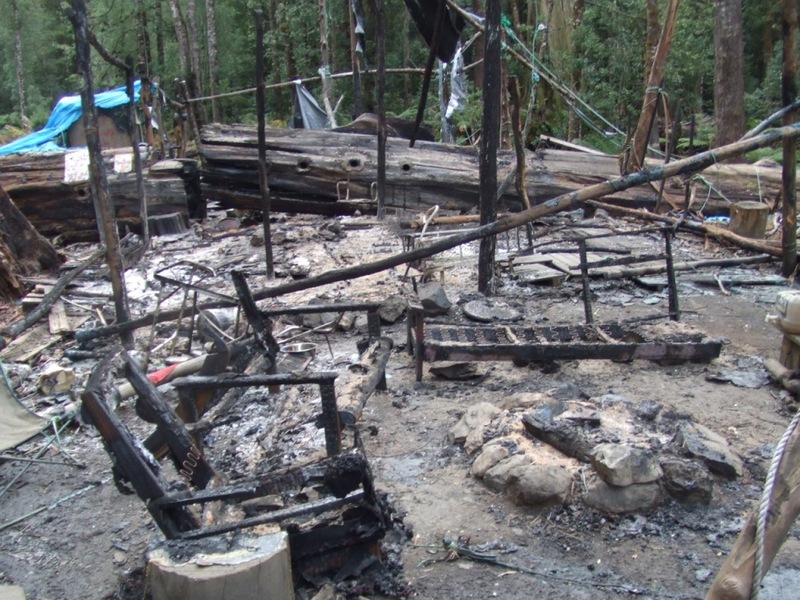 The main house, kitchen area and information hut were nothing but ashes. And the camp car had been stolen. This was not the first time that such acts of intimidation had been committed towards the protesters and community involved in the camp. Luckily no one was at the camp when the attack occurred. 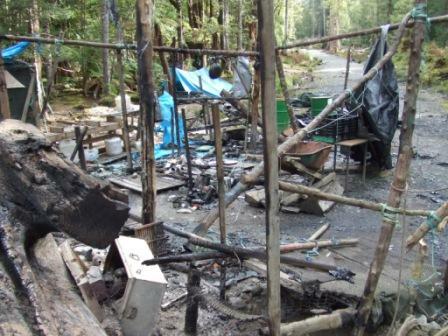 The next person who was rostered on to be at the camp turned up to a horrifying scene of the camp reduced to ashes. However, one has to wonder whether the attackers would have known there was no one there, as the camp is the usually always attendance and people could have been the forest nearby. In 2009 when there was a fire-bomb attack on the camp in the middle of the night, many people were there and were awoken in terror. Two people at the camp had their cars set on fire by the attackers, as well as the camp’s information center being torched. That 2009 incident occurred within days of a violent assault on myself and another protestor at a peaceful action in another part of the Upper Florentine Valley. Logging contractors used a sledgehammer to attack a car that we were in. Smashing glass in on us and screaming abuse. When we eventually managed to get out of the car, fearing for our lives, my fellow protestor was dragged to the ground and kicked in the head. This week, we have seen yet another act of violence against the non-violent protest movement. Up here in the Observer Tree I was in some ways far removed from what was happening at the camp. Yet, it had a big impact on me. There was the practical side of things of course, as the Still Wild Still Threatened spokesperson I spent the day talking to media, police and community members. But it also was a sad day for me. Although I am not able to be there at Camp Floz, obviously, I still care deeply about the place. Sometimes I really miss the Floz and one thing I am looking forward to when I get down from this tree is going back to walk in the forest around the camp and visit all my favorite little spots. And I care deeply about all the people who are spending their time maintaining the camp. And it is hard for all of them to have to be out there this weekend, shifting through the ashes and rebuilding the camp again. But it was also wonderful to receive so much support from the community and offers of help to rebuild. I guess it is a perfect time for a spring clean! And with so much help, I’m sure they will be able to build an even better camp. And so Camp Floz will, as it always has, rise up from the ashes. Please help to support the rebuilding of the camp. Obviously a lot of equipment was lost in this incident and if you can help at all to make a donation it would be greatly appreciated. Or why not get involved in keeping the camp running? Visit www.stillwildstillthreatned.org for more information. Posted on September 15, 2012, in Daily Blog. Bookmark the permalink. 8 Comments. It is disturbing to hear this news. Thankfully nobody was hurt. I hope you are staying safe in the Observer Tree. Congratulations on your wonderful work in the Observer Tree. All my family thank you for helping to protect the gentle giants of the forests. Hi Miranda. I’m not sure what to say, except that I share your grief. I was not part of the movement back then, and I never saw it as it originally was, but when I was shown over it by a mutual friend, I felt the sense of community, and saw the shock loss of majestic old growth out the back. That was almost exactly a year ago today. Memories will serve to drive commitment because goal is worthy. The forest has no choice. It is disappearing and has no-one else. Each has his/her own methods. We will be getting stuck into the bastards back at Habitat.